When was the last time you had an ice cream soda? If you’re looking for a way to infuse some delicious fun into your family’s everyday routine, grab some ice cream, the soda of your choice and show your kids the magic of the ice cream soda. We guarantee smiles all around. There are a few things that are such a part of childhood that it's almost impossible to remember when we first experienced them, as they simply became a part of the fabric of our adolescence. While we can't necessarily remember the first time we experienced those small joys, we do have the amazing opportunity to watch our children experience them for the first time. Or even the tenth time! Ice cream sodas are high on that list of simple childhood treats and luckily couldn't be easier to make at home. 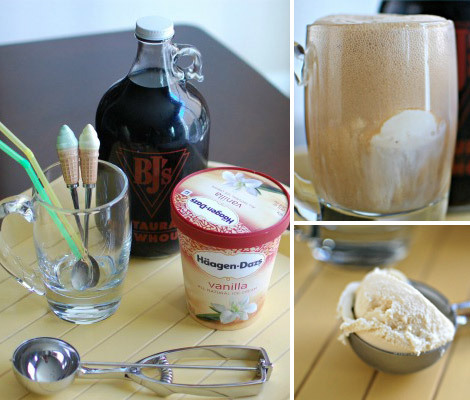 When we made our ice cream sodas, we upgraded our soda to handcrafted root beer from BJ's Brewhouse and we encourage you to upgrade to a premium ice cream as well. With such a simple treat made up of so few ingredients, we think that it's worth splurging on your ingredients since each flavor truly shines through. Place two scoops of vanilla ice cream in the bottom of your chilled glass. Slowly pour soda into the glass, over the scoops of ice cream. Pour the soda a little at a time to allow for the foam to settle. Serve with spoons to scoop up the ice cream and straws to savor every last drop of the creamy soda.